Digital marketing success isn’t defined in terms of Website traffic. There’s so much else to consider. However, benchmarking data on the overall level and composition of your site traffic vis-à-vis your competition can be useful. You’re appealing to the same broad audiences, and their behavior on related sites should have some meaning for you. This is a follow-up to last October’s post about the return of benchmarking to Google Analytics. Now there's data to analyze! Here's a first look at it. 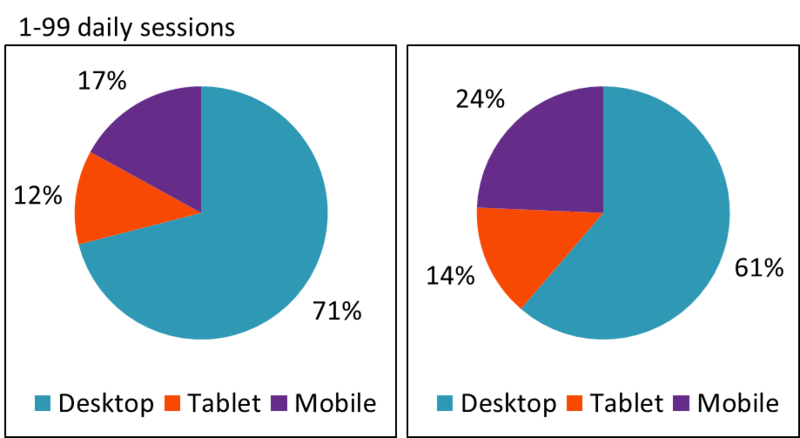 The graphs below reflect 12 months of activity (April 15, 2014-April 15, 2015) on 426 fund Websites whose firms have opted in to share anonymized data to enable benchmarking. The sites are grouped by number of daily sessions, and the data in the graphs are based on three groups: 0-99 daily sessions (sample=377), 100-499 daily sessions (sample=29) and 500-999 daily sessions (sample=20). Google doesn't yet have a large enough sample to report on fund sites with 1,000 daily sessions and more. All data can be found in your Google Analytics account. 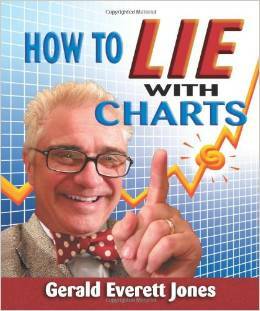 Just go to Audience/Benchmarking. I looked at data at the Funds level (including mutual funds, exchange-traded funds [ETFs] and hedge funds), exported in Excel spreadsheets to be able to work with it. This is more real (not based on user panels but on actual data that Google is collecting on sites) and more granular (most free benchmarking services stop at Finance or Investing in general, which includes brokerage sites). When mutual fund and ETF site benchmarking data is able to be reported separately. That can’t happen until a sufficient number of properties agree to contribute data. If your firm hasn't yet opted in, you might want to consider. More on that in my previous post. When some category inconsistencies are addressed. Google has no trouble recognizing direct, search (organic and paid), referral and even social traffic. But if site publishers aren’t using tracking code to distinguish between display and email traffic, Google may mis-categorize it as direct traffic data. You’ll see below that Google benchmarking data is being reported for paid search, other paid traffic sources and email for the less trafficked sites but not for the most trafficked sites. When you isolate your own peer group and delve in. I’m presenting the three groups together to get a high level sense of fund company Website traffic in 2015. Compare your site's traffic to your peer group and you’ll learn more. 1. Overall, it looks as if the most that a fund site can hope for are a couple of minutes of the visitors’ time and a couple of pages viewed. This data suggests—let me amend that—makes the argument for easy-to-find content on sites that anticipate the task-oriented visitor. They come, they get, they go. Not that there's anything wrong with that. 2. Finally, we have data on the contribution being made by social efforts and by email—two areas that there is great interest and investment in. 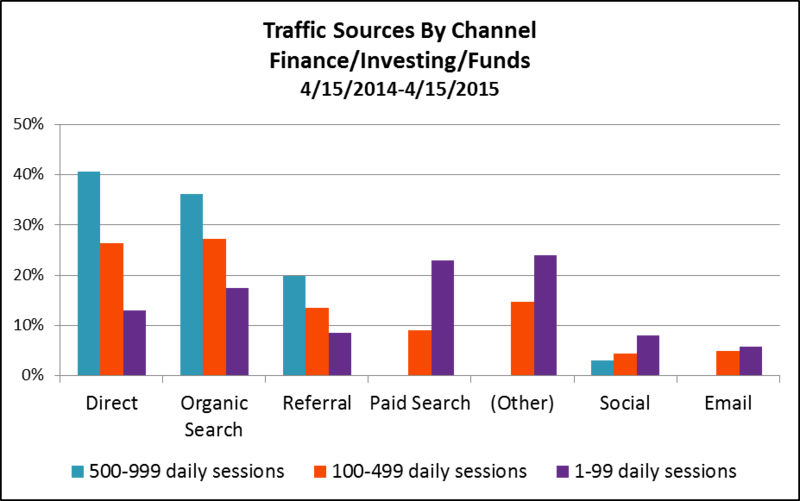 In fact, see the growth in the total number of sessions driven by social in the most recent 12-month period over the previous period. 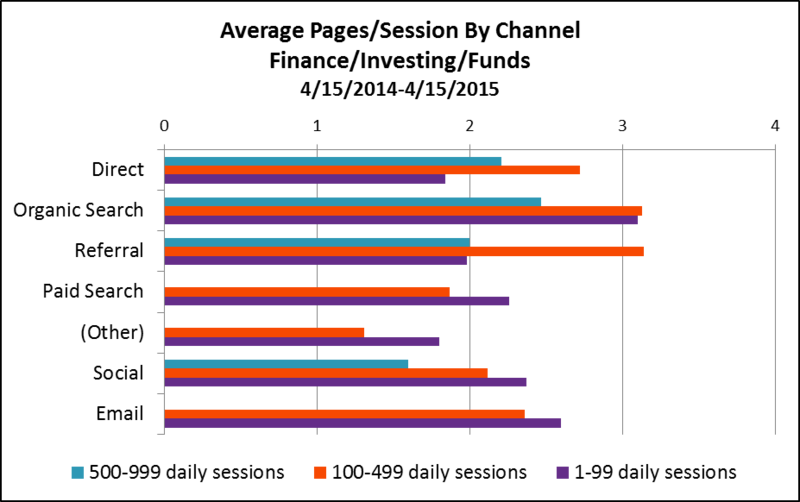 Benchmarking data is available only from August 28, 2013, so the earlier period comparison is from 8/28/2013-4/14/2014, eight months versus 12. 3. Direct traffic (a reflection of brand awareness and product familiarity), organic search (a measure of content availability, quality and accessibility) and referral links drive the better trafficked Websites. 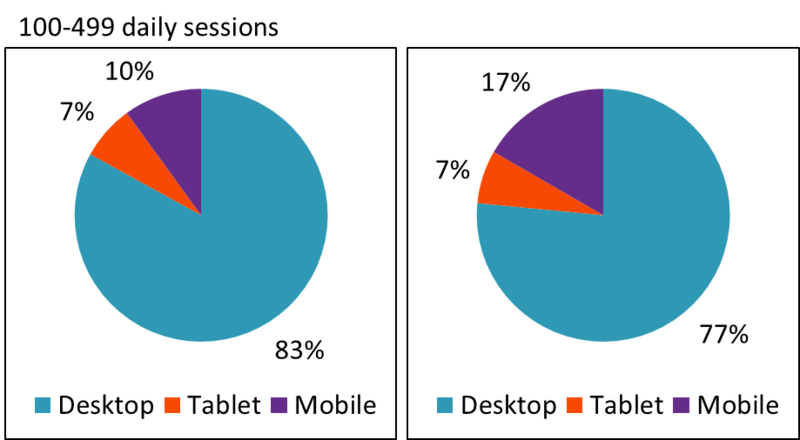 Less trafficked sites rely on paid search, other advertising and organic search. 4. There’s a difference in the traffic sourced by each channel: Direct traffic, organic search and referrals lead to more longer-duration sessions, with more pages viewed. 5. 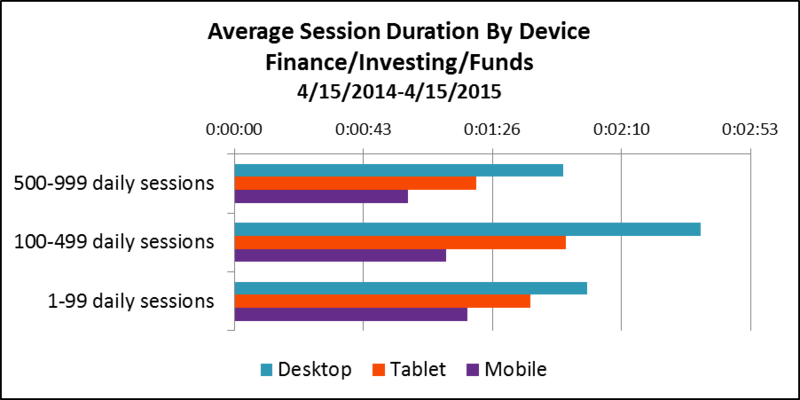 Just about one out of four visitors to fund sites comes from non-desktop devices (e.g., tablets or smartphones). This is a remarkable change that has undeniable implications for sites created for desktop use. 6. Desktop sessions last longer than mobile sessions, which is to be expected. But, there isn’t a big difference in the number of pages viewed across devices. Here too, it’s few pages across the board. Drilling into your firm’s analytics will help you understand whether this is a good or bad thing. It’s good if you can see that visitors are immediately finding what they need and then moving on. Not so good if the short visits point to visitors—even more frustrated because they're on smaller screens and possibly on the go—who give up. Out of curiosity, I also looked at the benchmarking data of sites that are in the Financial Planning & Management category, which together represent about 6,800 Web properties. Nine out of 10 of these attract fewer than 100 daily sessions. Google reports data on sites attracting as many as 10,000-99,999 sessions. Few advisory firms may enjoy the brand recognition of your firms or the marketing budgets. 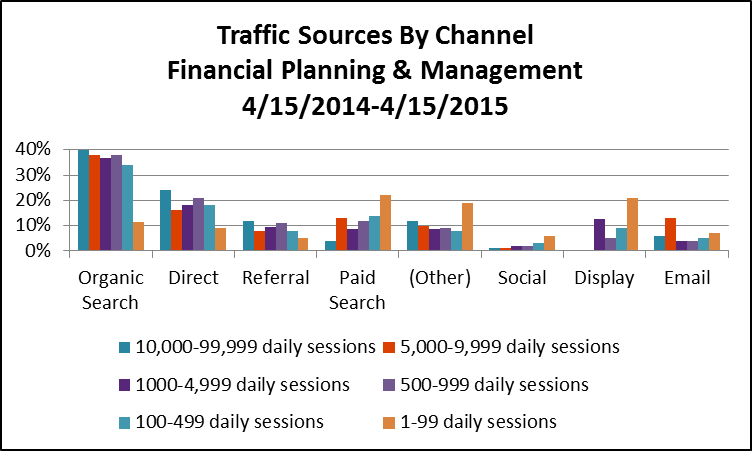 The benchmarking data gives us an idea of the organic search strength among financial planning sites. And there's more—but I'll leave the rest for you to explore. After this post, I’m going on a PIMCO/Bill Gross/Twitter diet, I promise. But, I was looking at some data this week that was too rich not to share. First, the September 26 announcement that Bill Gross was leaving PIMCO to go to Janus spiked interest in “Bill Gross” as a search term but not so much fixed income. This is according to the Google Trends U.S. data shown below (click on the image to see the data more clearly on the site). Interest in Janus was far above average search interest while still lower than "Bill Gross." On Twitter, where Gross' early use of the @PIMCO account influenced how other asset managers began to use Twitter to deliver timely, relevant micro-insights (see post), the news gave a healthy bump to the use of the #fixedincome hashtag. In the period between September 29 and October 22, 189 users sent 310 tweets with the hashtag, according to Keyhole.co. The RiteTag graph below of tweets and retweets shows a rush to #fixedincome, relative to its average volume, that has since petered out. Here's what I was interested in. We saw some opportunistic fixed income advertising from fund companies in the days immediately following the news. And, of course, the email factories were working overtime. Did asset managers figure among those jockeying for what would be a burst of fixed income attention on Twitter? Why yes, they did. 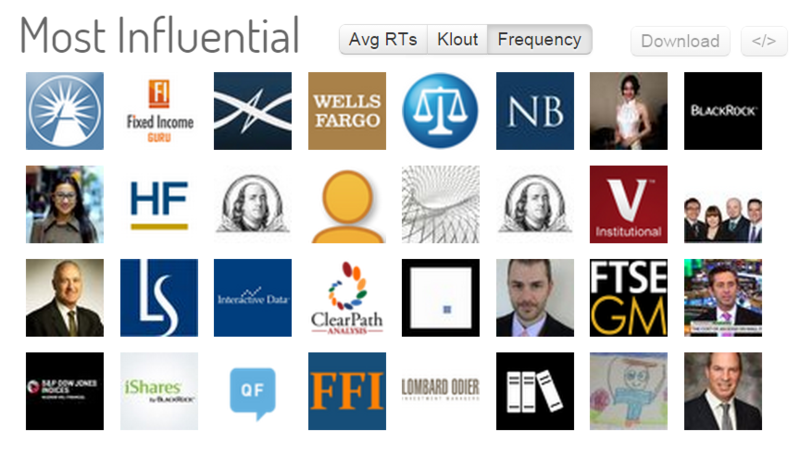 The screenshot below from Keyhole.co shows the 32 accounts that used the #fixedincome hashtag most frequently. Twelve belong to asset managers, with @FidelityAdvisor, @NuveenInv, @WFAssetMgmt and @PutnamToday four of the top five accounts. Other firms participated at a lower level. In all @FidelityAdvisor sent 37 #fixedincome tweets, most in support of Fidelity Advisor Total Bond Fund. @BlackRock takes the honors as the account producing the top #fixedincome tweet (shown below), drawing 18 retweets and 38 favorites. @FTI_US, Putnam and @HartfordFunds were #2, #3 and #4 ahead of @SquawkBox. Sweet. What did the news do to @PIMCO’s enviable follower count? It's happy news all-around. After a dip—there’s likely some correlation between fund flows and Twitter followers—@PIMCO is back on the rise again, according to TwitterCounter.com. 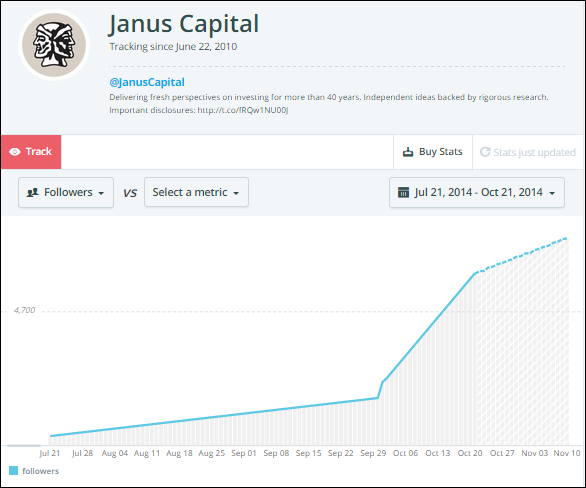 Meanwhile, @JanusCapital experienced a growth spurt in followers, although still trails @PIMCO by about 174,000. There are very few lightning-in-a-bottle moments for mutual fund and exchange-traded fund (ETF) companies using social media. There’s been no equivalent of seizing the opportunity of a dark stadium to promote dunking an Oreo cookie and watching the Twitter account grow by thousands overnight, for example. But communications windows open and close on Twitter, and there can be opportunities for alert and agile investment brands. For some perspective, fund companies use other hashtags and many to a greater extent. 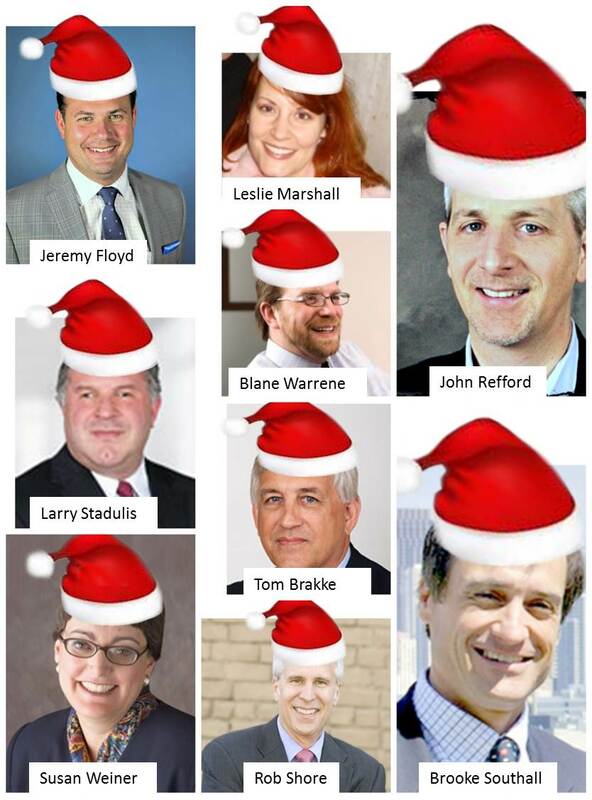 Event hashtags get lots of pick-up, as Morningstar's Leslie Marshall has documented. And, it’s not as if @BlackRock hasn’t been retweeted 18 times before—its maximum is 155 RTs. 6)that targeted others (financial advisors, media and other influencers) had hyper-interest in and were seeking commentary on. For those of you in the mix, I hope something good came out of your participation. As for those of you still on the fence about Twitter, does this episode make you any more interested in chiming in? How are you measuring the effectiveness of your email marketing? You’re looking at open and click-through rates (CTRs), no doubt. But recent research suggests that multiple email opens may have added significance. 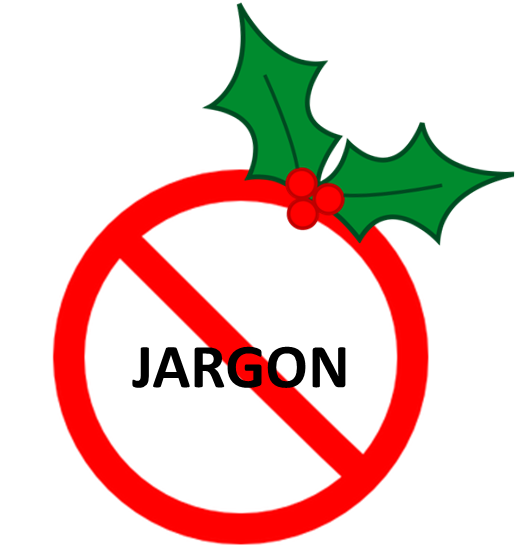 Failure to understand multiple email opens could result in an under-assessment of the appeal of your emails. This is particularly germane for those of you who pay advertising partners for email blasts. We’ll get into it below but fair warning: This delves into a fuzzy area of email campaign performance measurement. For the last few years, data has shown that mobile devices are being increasingly used to read emails. And, email marketers have made design, layout, content and even functional (e.g., click to call) adjustments to drive opens and click-throughs on smartphones and tablets. Mobile devices are an efficient way of using stolen moments on the go to stay on top of an Inbox. But not every email—and I’m thinking of investment management offers of whitepapers or videos here—can be dealt with so quickly or easily while on a phone. In fact, YesMail last year reported some interesting data on financial services emails in general (probably not asset manager emails sent to financial advisors) accessed on mobile devices. 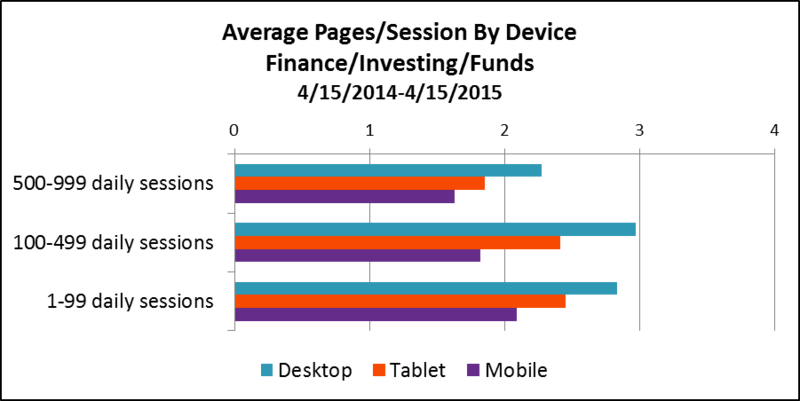 While financial services email subscribers topped the list of industry email subscribers who preferred to view emails on mobile, it was at the very bottom of the list of those who clicked to open on mobile. In this latest report, email provider Campaign Monitor is highlighting a new email consumption habit it refers to as “triaging”—aka flagging the good ones to be read later, possibly on a different device. A triaged email was opened, not clicked through then and there, but possibly saved to be read again later. “The shift to mobile has made it more difficult to get readers to engage with your content...The new standard in successful email marketing is not only capturing a subscriber’s attention but holding it long enough to get them to return and engage with your content,” says Campaign Monitor in its Email Marketing Trends report. As email opens shift to mobile devices, there’s been a correlating decrease in click-throughs—a 10% decline from 2012 to 2013 alone, according to Campaign Monitor. Of course, your reporting is duly tracking click-throughs. But if all you’re tracking is opens and CTRs, you may be missing something. Here’s where it gets frustrating. 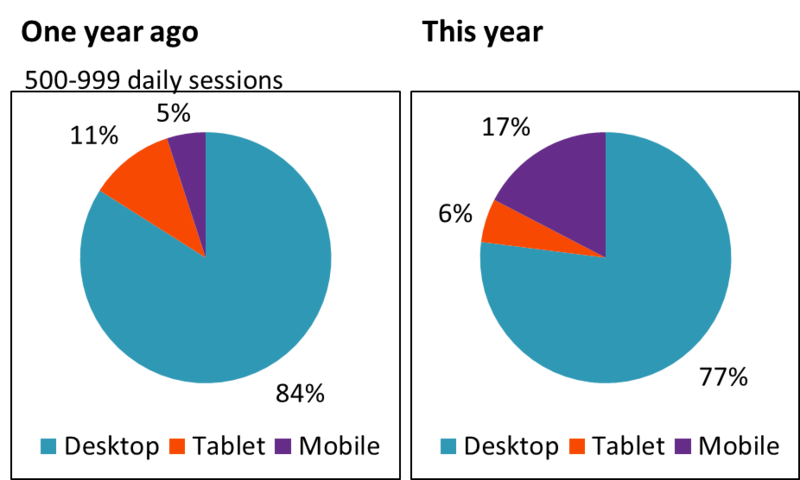 Data that reports on email open activity is routinely accompanied with a few qualifiers that seek to explain why open data may be both under- and over-counting. Email open tracking depends upon the downloading of an invisible 1×1 pixel gif image as embedded by the email provider. As the Internet Advertising Bureau (IAB) warns, “some opens may not be detected when, for example, the user has images disabled, is on a mobile device, or has elected to receive text-only emails.” That would lead to under-counting. And, as Campaign Monitor acknowledges in its study, “Apple devices display images by default—thereby automatically registering an open—whereas many Android email clients don’t.” This could result in overrepresentation of Apple users in your data. On the other hand, the IAB explains, “the metric may also falsely indicate some impressions when the message is briefly loaded into the preview pane but may not be actually viewed by the recipient.” Some email clients render HTML within the preview pane—every time the user scrolls through the Inbox and passes your message, it will count as an open. The industry’s answer to this has been to focus email senders on Unique opens, a metric that eliminates the duplicates included in Total opens. But the Campaign Monitor research raises a possibility that makes sense, especially for investment firms that are heavy users of emails to communicate with mobile-reliant financial intermediaries. It stands to reason that the multiple opens number includes some opens that indicate your content’s ability to prompt a second look. A second look isn’t a click-through but it’s something. It’s more than an open and out. 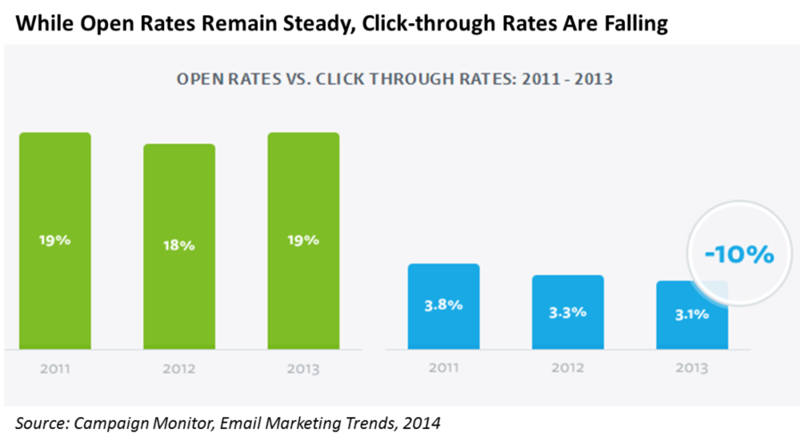 And, at a time when click-through rates are falling at a rate of 10% per year, multiple opens seem to be worth spending some time to better track and understand over time. I would try to get my hands on your firm's Total Opens and Unique Opens data, including from media partners whose lists you use. Data that enables you to segment email response by device and email client would also be valuable to add to your reporting. The first battle is to win the mobile open: As has been well documented, an increasing percentage—41% according to Campaign Monitor—of email is being read on mobile devices. The most common time to click on an email is when it’s initially opened. 87% of clicks will happen then. And yet, the fewest clicks happen the first time an email is opened on a mobile device. Only 78% of clicks on mobile devices happen on the first open. A second device optimizes the second chance: If a mobile reader opens an email again from a different device, more clicks happen. 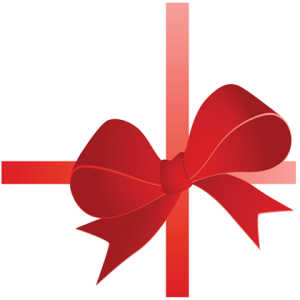 Mobile readers who open emails a second time from their computer are 65% more likely to click through. The Campaign Monitor Web page has a flowchart that visualizes this.